MHS’ Caitlin Cotner (13) fires up a shot against Upper Arlington on Friday. The Lady Monarchs fell, 45-33. Slowly, but surely, first-year Marysville girls basketball coach Brooke Young feels she’s changing some attitudes about her program. “We are taking strides to reshape Lady Monarch basketball,” she said after Friday’s 45-33 Homecoming loss to Upper Arlington. “We are becoming a team that is known for being tenacious,” she said. “We want to make every opponent work for everything they get. Young was particularly impressed with the defensive job that Caitlin Cotner did on UA standout Macy Spielman. The sharpshooter led all scorers with 25 points, but she forced quite a number of shots that failed to find their mark. “I thought Caitlin did a great job on defense,” said Young. 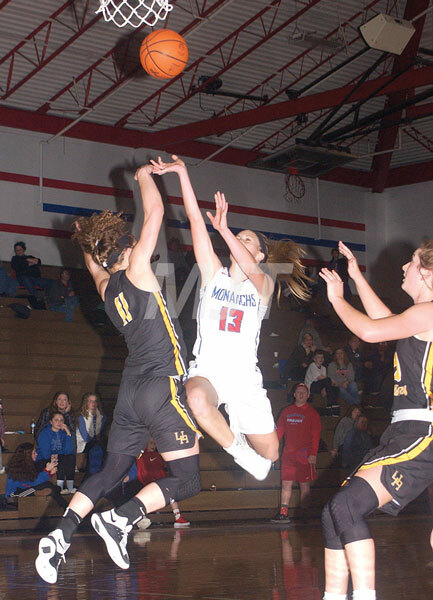 The Lady Monarchs (who finished the regular season with a 10-12 record) jumped out to a 6-0 lead on baskets by Cotner, Logan Brown and Kassidy Lee. Although Spielman fired up a bunch of shots, she was able to later tie the game at 8-8 on a spin move to the lane. The teams swapped possessions during the final minute and the score remained knotted at the end of the quarter. The Lady Bears went on a 6-0 run, sparked by a pair of buckets from Adrienne Wachtman. Haley Cook broke the string by converting a steal into a layup that pulled MHS to within 14-10. Colleen Moore knocked down a three-ball for UA. A jumper from Cook and Karleigh Sutter’s three-pointer pulled Marysville to within 17-15 with 3:41 left in the half. Brown scored again to narrow the gap to 20-17. A free throw by Erisa Pippins and a stickback by Spielman stretched UA’s margin to 22-17. Sydney Lee scored for the Lady Monarchs down the stretch. Spielman, however, did the same as Upper Arlington took a 24-19 margin at the turn. A basket by Moore and a three-ball from Spielman pushed the visitors out to a 29-19 spread within the first minute of the third quarter. A jumper by Emily Daniel, a pair of shots from the foul line by Cotner and Tinley Graves’ trey narrowed the Lady Monarchs’ deficit to 33-28 with 2:06 remaining in the quarter. Another three-ball by Spielman, though, sent the Lady Bears into the fourth stanza with a 36-28 advantage. A free throw by Pippins put UA up by a 39-29 count early in the final set. The teams swapped empty possessions until Wachtman’s bucket made it a 12-point game at 41-29. Sydney Lee and Cook scored to close the distance to 41-33. Those buckets, however, marked the final points for the Lady Monarchs. Moore hit a basket with a minute to play for a 45-33 lead. From that point on, UA was able to run out the clock. With the regular season now in the books, the Lady Monarchs will begin tournament preparation. They will travel to Dublin Scioto on Saturday, Feb. 16, for a 1:30 p.m. tip-off in the Division I post-season. Spielman 10-3-25, Wachtman 5-0-10, Moore 3-0-7, Pippins 0-3-3, Hargraves 0-0-0, Poling 0-0-0, Lape 0-0-0, Fuller 0-0-0, Pritchett 0-0-0. Totals 18-6-45. Three-point goals: Spielman 2, Moore 1. Cook 3-0-6, Cotner 1-2-4, K. Lee 2-0-4, S. Lee 2-0-4, Brown 2-0-4, Graves 1-0-3, Sutter 1-0-3, Francisco 1-1-3, Daniel 1-0-2. Totals 14-3-33. Three-point goals: Graves 1, Sutter 1.